UmTRX provides a single board solution for industrial SDR applications which require the frequency stability and accuracy of a GPS synchronized clock, and supports two full-duplex and fully independent RF channels which can run on any frequency from 0.3-3.8GHz. Each channel has its own LMS6002D transceiver IC that is fully programmable and which can be configured for baseband bandwidths of 0.75-14MHz. These state-of-the-art devices are connected to an FPGA via 12-bit parallel buses for each transmit and receive path. The company behind the LMS6002D, Lime Microsystems, have fully embraced open source and made comprehensive documentation available without the need for an NDA. 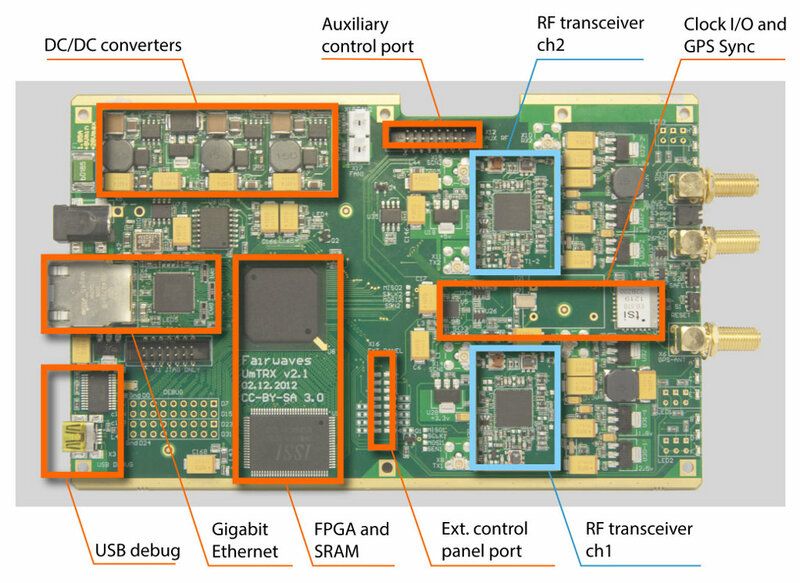 A capable Xilinx Spartan-6 FPGA with 74K macrocells is at the heart of the platform, and in the default configuration is used with an open source 32-bit CPU core and for hardware DSP functions such as digital down-conversion. Full HDL sources are provided and the platform can be modified to accommodate a diverse range of applications. For example, an alternate 4xDDC firmware is available that increases the number of paths that can be processed for receive-only applications. The TX port output power is 100mW @ 900MHz and 50mW @ 1800MHz. To give an example, this would provide 100-200m coverage when used with one of the four main GSM bands and an external duplexer and small omnidirectional antenna. The range covered can easily be increased through use of a simple external power amplifier and directional antenna. Host connection is via Gigabit Ethernet and multiple boards can be stacked using a standard switch, with the option of sharing a common clock source. Firmware can be updated over Ethernet or by using a JTAG cable, debug is over USB UART, and provision is made for interfacing peripherals via GPIO. Thermal sensors are included for temperature-based calibration. In addition, every board manufactured by Fairwaves are rigorously tested across the operating temperature range of −40 °C to 75 °C, and suited for use in carrier applications.